Before my recent attack of Bromeliadmania, the only members of the family that I had any luck with were the epiphytic Tillandsia species, commonly called air plants. I found that I could keep these alive and happy as long as I misted them daily, and periodically submerged them in a tub of water, say once a month or so. Recently, I bought a new batch, and decided to attach them to some decorative wood pieces. All of them had identifying tags, which doesn't happen often enough. 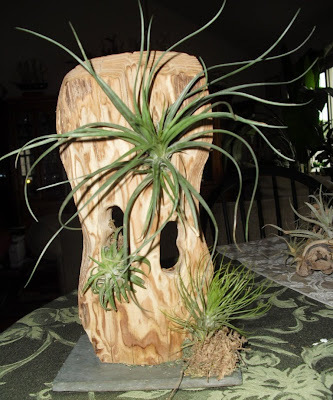 Tillandsia schiedeana. This one is kind of unruly looking, but it does have multiple crowns and a couple of flower buds. Here is the first arrangement. I attached my plants by finding natural holes in the wood, sticking the root ends in the holes, and then filling the space as tightly as possible with wet sphagnum moss. When the moss dries and expands, it usually holds the Tillandsias fairly tightly in place. If not, I add more moss. I've tried glue, as well as tying them to the supports with fishing line, and haven't found either to be satisfactory. This is driftwood from the reptile habitat aisle of the pet store. The new T. schiedeana and T. ixioides from above are the two plants on the left, joining another T. ixioides, a T. caput-medusae and a NoId that I've had for a while. This wood piece is also from the pet store, and is attached to a piece of slate, which forms a nice stable base. The new T. andreana is at the bottom, in a soda bottle cap which I glued to the base, and then disguised with moss. The new T. stricta is at the top, and the center is a previously owned NoId. Again, the plants are held in place by packed sphagnum moss. I purchased this last piece of wood about 13 years ago, when I was browsing through the pet store with my then-boyfriend. When I picked it up, he asked me what I was going to do with it, since he knew I didn't keep reptiles. When I told him I wasn't exactly sure, but that I could visualize using it in some sort of houseplant arrangement, he exclaimed "You're the Martha Stewart of houseplants." I answered, " That's really sweet of you, but I'm pretty sure that Martha considers herself to be the Martha Stewart of houseplants." Nice displays. I was looking at some driftwood today too for my Tillandsias. I think if I found some for sale with name tags like that I'd be in a lot of trouble! This is hIlarious! I was dressing my porch up yesterday and I was thinking about adding my air plants but I wasn't sure how to do so. I overlooked my large pieces of driftwood sitting around out there. Oops. I guess that's why it's wonderful to read these postings, and important too. Love you Martha comment and I completely agree with you too. What a good idea to look for wood at the pet store...I have bought rocks and skulls there for displays though...my fav finds are from thrift stores adn garage sales tho!!! This is beautiful for your tillandsias! I have one shallow ceramic container with about 8 plants in it. I was gonna try E6000 glue to hold them in, which I have heard is the best.